At Clearview Stoves we don't just produce the best stoves, we provide a complete service. This includes advice and all of the products you will require for a safe and efficient installation. If you are building a new chimney or fireplace try and choose your stove first, the installation can then be correctly planned. 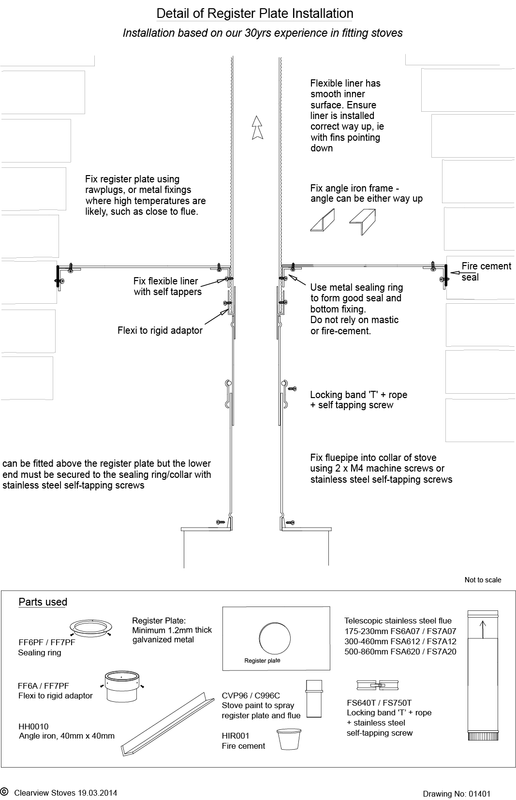 The rear flue position will bring your stove further forward; this will normally provide maximum efficiency however a little more chimney draft is required. The rear flue position is often chosen when a chimney is very high and may provide more flue draft than you require. If the chimney is short, cold or has excessive bends a top flue is advisable. When installing in a single storey building, boat, cabin or caravan a top flue will perform best. It is important that air be allowed to circulate around the stove, ensuring that most of the heat is drawn out into the room. A good clearance helps to achieve that. However it may be possible to compensate a lack of lateral clearance with increased clearance above. Equally reduced clearance all round may be countered by rear flueing the stove thereby bringing the appliance out onto the hearth a little. Bear in mind as well that the clearance required around the stove will vary according to the size and insulation level of the room it is trying to heat, A small stove in a large or cold room would benefit from more space around it, where as the same stove in a small room would not need as much. A chimney is a passage from the place of combustion to the outside world. Warm flue gases should rise through this passage to the point of exit. For a chimney to operate satisfactorily it should be smooth, warm and as straight as possible. If a chimney is irregular and rough, or cold and damp, flue gases will move slowly. Cooler gases will mean inadequate chimney suction and poor flue gas speed. Flue re-lining is not mandatory however re-lining an existing flue has many advantages. The existing chimney should be thoroughly cleaned before relining. It is often best to have the flue liner inserted from the top and guided from the bottom as well. Where the existing flue diameter is narrow and there is a question of space a nose cone or similar can be used to guide the liner through. Often a small offcut can be tried first before the main liner is inserted. A flue liner will substantially decrease your chimney volume, consequently higher temperatures will be maintained and flue gases will travel faster generating greater and more consistent draft. When possible flue liners should be insulated, increasing flue temperature. A warm flue will collect less deposit, cleaning will be much easier, condensation should not occur in the flue. It is possible to clean a lined flue well, leaving the liner almost as clean as new. It is rarely possible to remove all deposits that accumulate in unlined flues, there are always holes and corners a brush does not reach. Fuel contains moisture that will evaporate through your flue and chimney system during combustion. It is important that chimneys are insulated to reduce the risk of moisture condensing. Insulating the liner will provide several benefits to the overall installation. Flue gases will remain warmer for longer, liner will be more rigid and easier to clean, and some protection will be given to the internal walls of the existing chimney which may be old and worn. In tight spaces perlite would be more practical, bridging is less likely to occur and gaps less likely to form. For larger chimneys where more than 2 bags of insulation per meter are likely to be used Chimwrap is a more cost effective option. The liner is pre wrapped in insulating blankets before being inserted into the chimney. In our opinion insulating the liner will always improve the performance of the stove and lengthen the life of the liner. It is important to minimise the risk of rain water leaking into the space between the chimney pot and liner. Clearview Stoves have for many years used a stainless steel pot hanger to ensure water does not seep into the chimney. In situations where the chimney pot and capping are in good condition and it is decided that the pot should not be removed a ‘pot hanger’ may be used to provide top support for the liner. A chimney net can be attached to the ‘pot hanger’ to prevent birds nesting and reduce the chance of rain entering the flue liner. The bird guard can be removed for easy inspection and cleaning without disrupting the ‘pot hanger’ seal. This simple arrangement provides a durable, long lasting seal at the top of the chimney and can allow the chimney void to be vented. Clearview Stoves keep thousands of items of flue pipe in stock. Provision for cleaning the chimney is important, we have telescopic flue sections and clean out lengths. Flue pipe can be ordered with your stove direct from the factory or through most Clearview stockists. Flexible metal liners should be used to reline existing chimneys. Where there is no chimney, or where the existing chimney is old and degraded, then other options must be considered. Pumice chimney systems are the ideal solution in these situations. Easy to construct, inexpensive and long lasting, pumice flue liners can be used to build new flues or relining existing chimneys. 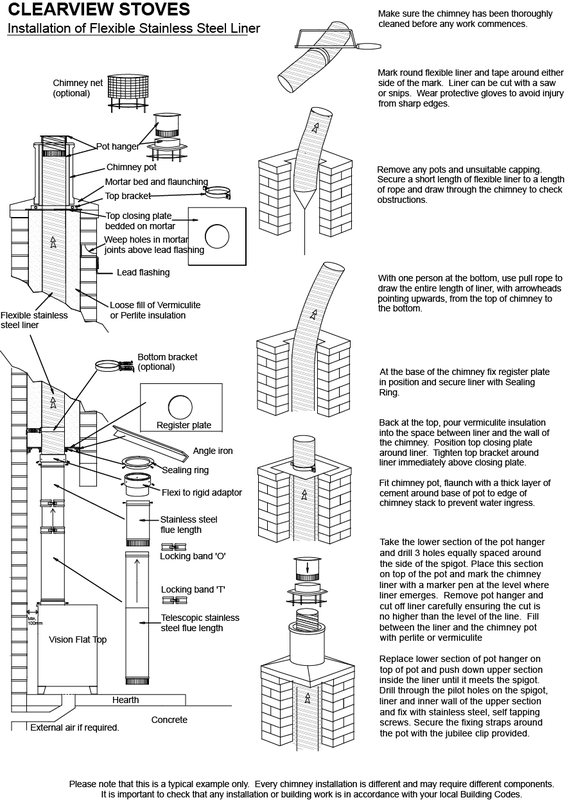 Pumice flues come in two options, details of which can be seen below. In some situations the best flue option is what is termed a Twin Wall Insulated Flue. This flue is stainless steel and comes with insulation injected between the two walls, reducing the clearances to combustibles to as little as 50mm in some cases (although individual flues vary in this respect). We generally recommend that the stove is positioned in such a way that allows the flue to be as straight and as warm as possible thereby providing a more consistent and stronger draw. This allows the stove to be more efficient and forgiving of colder conditions. In addition internal flues that are passing through rooms above often prove to more cost effective, and we suggest that this option is considered first, before reverting to an external flue system. Internal flues also contribute significant heat to the rooms upstairs. It is worth bearing in mind all options before coming to a final decision and we are happy to give advice with regard to stove position and other considerations.